If you know me, I'm big on fine motor skills for the little ones. 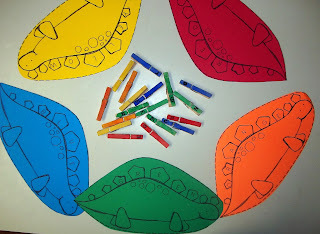 I created this dinosaur themed activity for all who love to teach about dinosaurs. 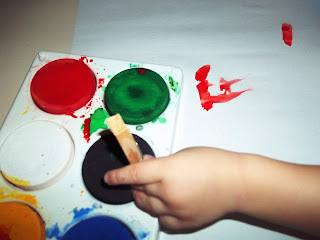 My main goal was to create an activity that promotes fine motor skills in a fun way. Plus, plus special education students and students with autism often need help developing fine motor skills and I think that this activity is a good fit too. This is a super way to teach color recognition as well as get students to work with letter and word recognition. Why just teach one topic when you can teach more at the same time, right? Integrate fun! Here's how it works. 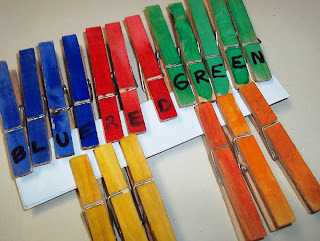 Let your little ones paint a set of clothespins. 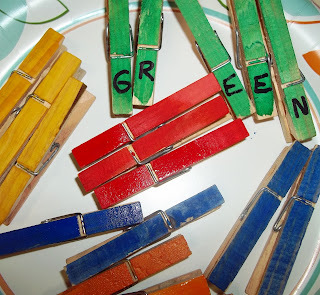 Paint one clothespin for each letter in the words for the colors that you'll use. So you will paint three red for R-E-D. We used tempera paint cakes. This is one of my classroom must-have items. Forget the jars or even the... gasp..powder. Use tempera cakes. Then add the letters to the clothespins with Sharpie markers or any type of permanent marker. You'll need to do this step. 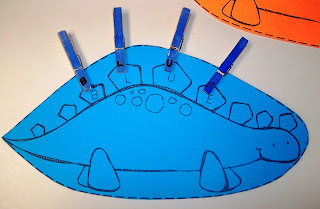 Now, what the kiddos will do is match or clip the clothespins to the stegosaurus that is the same color. Older kiddos will match the letters too. Notice how I left the letters off of the orange and yellow clips. This is for students who will have difficulty matching the letters too. 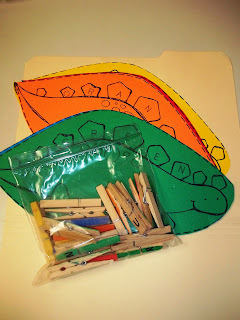 One student can work on this dinosaur folder center or you can make a dinosaur train for a small group activity. 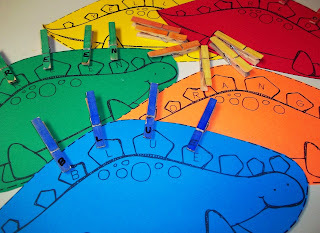 Place the dinosaurs in a circle and put the clothespins in the center.